MILLEDGEVILLE, GA — The Campus Theatre opened in 1935. It was designed in the popular Art Deco style of the day. The theatre closed 1983 and ownership of the theatre changed hands several times over the years. Talks of reopening the theatre never materialized. In 2006 plans to convert the theatre into a “mixed use” building were discussed. 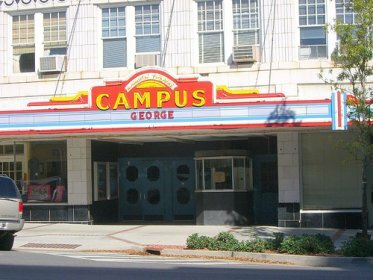 In February 2008 then current owner Randall Hattaway sold the theatre to the Georgia College & State University for approximately $800,000. Plans were approved]([url=/news/16868_0_1_0_C/) in May of 2008 for a “conversion” of the theater which began in June. The finalized plans restore the exterior of the theatre, including the marquee and box office, to its original design. The lobby, a portion of the first floor and added basement space will be converted to a book store. The current auditorium will be replaced with a literal black box that will contain a theatre for mixed use presentations. The balcony will be converted into office space along with the current offices already located on the second floor. The theatre was refurbished sometime in the sixties or seventies. All traces of the deco interior were either removed or covered with paneling. The link to the video below from an article at Macon.com http://www.macon.com/198/story/408619.html shows the present state of the theatre’s stark interior during a walk thru of the building. Oliver Hardy was born in Hariem, Ga in 1892. At 18 he became the projectionist, ticket taker, janitor and manager at the newly opened Palace Theatre in Milledgeville. He was said to be so obsessed by films after taking the job that he decided to launch his own film career. By 1914 he had made his first 1-reeler for Lubin Studios in Jacksonville. In 1927 he partnered with Stan Laurel and formed one of the most famous and beloved comedy teams of all time, “Laurel and Hardy”. Also Sandra Jones, a volunteer for the Milledgeville-Baldwin County Convention & Visitors Bureau, gives black history tours around town. The Campus Theatre has been one of her stops. The theatre, typical of many in smaller towns during the period, accommodated black patrons by allowing them access to the balcony only to see the films.